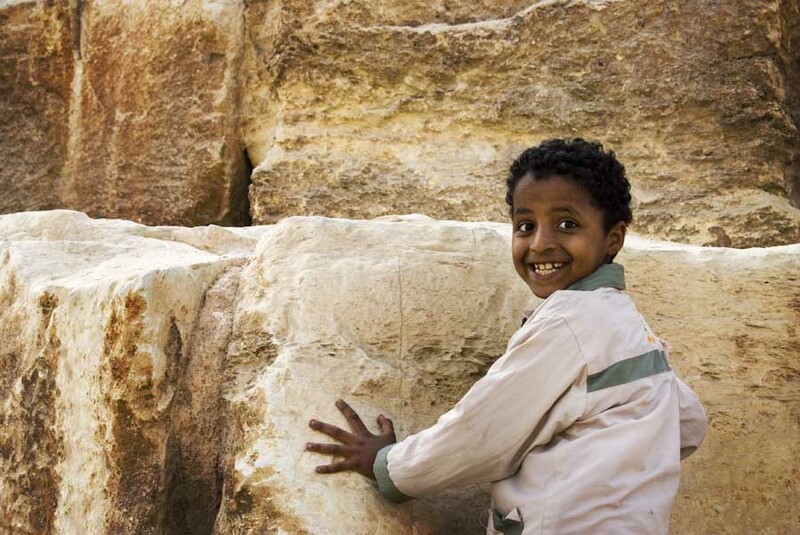 This Egyptian boy was having a blast playing at the base of the Great Pyramid! On our first day in Egypt we went straight to the pyramids of Giza and all that jetlag was soon forgotten. Witnessing the Great Pyramid, Sphinx, and surrounding history in Giza was a moment I and many in our travel club’s group trip to Egypt had been waiting for since childhood. I love this picture because this Egyptian boy playing at the base and touching the massive stones of the Great Pyramid was exactly how many of us felt! It’s truly remarkable how the Egyptian civilization accomplished these seemingly impossible feats of architecture with the technology and resources at hand. Can’t wait to plan another tour to Egypt and the Pyramids with our travel club! I absolutely love this smile. Great shot…pretty sure I’d be smiling like that too if I were at the great Pyramid!